Challenge of the Americas Digital Recap Magazine Now Live | Challenge of the Americas! Exciting weekend of racing in Tucson, Arizona for premier winter karting series on the left coast. The eighth season of the Rotax Challenge of the Americas program commenced over the January 9-11 weekend at the Musselman Honda Circuit in Tucson, Arizona. 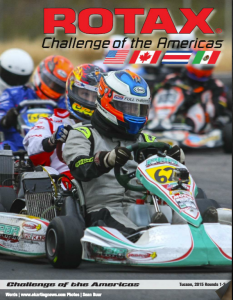 Over 100 karters gathered to contend in the premier winter karting series on the left coast, with four of the Rotax Max Challenge divisions beginning their journey toward the 2015 Rotax Max Challenge Grand Finals tickets up for grabs to the series champions. The weekend in Tucson was historic for seven of the 10 drivers to win over the two days of racing, standing on top of the podium as first time winners in the series. This entry was posted in Media, Tucson by challenge-admin. Bookmark the permalink.